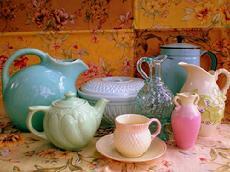 The pottery industry grew out of the early farmer�s need for inexpensive containers and tableware. Early potteries were only part-time operations. Often owned by farmers, and worked between fall and spring, these potteries coined the name �Bluebird� because the production started when the bluebirds returned from the south and the clay would be mined. Bluebird potteries, such as Eal Run, Possum Hollow, Breadless, Poverty Hollow, and Henpeck, became so predominant that by 1850 there were about 41 different potteries operating three miles within the Ohio pottery museum in Crooksville. Clay was mined nearby and prepared for use by horsepower. The average Bluebird pottery contained two kickwheels on a log building about 20 X 24 feet, having just two doors and two windows. The kilns were round, 9 � 10.5 feet in diameter and 6 � 8 feet high. They were made of either sandstone or firebrick and had two fireboxes, one door and moon-shaped flues for draft. Ware was placed on stoneware platters or constructed to be placed on each other. Kilns held an average of between 2,000 to 3,000 gallons. The theories for why the companies began to branch into making a more decorated ware were varied. Some founding fathers were just driven by the need to have the �best, most finished product.� Others were motivated by the rising hobby of the genteel young ladies who were painting lovely pictures on china. Still another reason was the trend to move into the luxurious surroundings in the cities as more and more wealth was attained. Whatever the reasons, this area became well known for its art potteries. Hull is just one of the approximately 22 companies which existed and made ware specifically for the adornment of the home. In 1994, the first Hull convention was organized by Joe and Betty Yonis and assisted by Kenny and Linda Williams, Al and Nancy Dennis, and Stella Frash. In 1996, the Hull association was formed with 90 members and presently it has 813 nationwide. Today, as well as the Crooksville Hull Convention, the association has expanded, and now has a Midwest regional convention annually in Western States. Hull Pottery began production in 1905 in Crooksville, Ohio, under the leadership of Addis Emmet (A.E.) Hull. The A.E. Hull Pottery Company's early lines consisted of common utilitarian stoneware, semi-porcelain dinnerware and decorative tile. The company quickly established a firm market and enjoyed an excellent reputation for producing quality ceramics. The company's success continued and, over the next several years, the business expanded. In the 1920s, the A.E. Hull Pottery Company maintained its general offices and factories in Crooksville and had an office and a showroom located in New York, offices in Chicago and Detroit, a large warehouse in New Jersey. It was also during the 1920s that Hull began expanding the variety of his company's product line to art pottery. The company also began using a broader variety of colors and glazing techniques with its products. A.E. Hull died in 1930. Addis E. Hull, Jr. succeeded his father in the management of the business. Hull, Jr. left the company in 1937 to become the General Manager of The Shawnee Pottery Company. Gerald F. Watts became the new manager of Hull Pottery. Also in 1937, the company contracted with Shulton of New York to manufacture pottery cosmetic containers (most known for the Old Spice shaving product line). By the late 1930s through 1950s, Hull was making some its best work. By far the most popular line to come from the factory was Red Riding Hood. The figural cookie jar was produced in 1943. Hull developed art pottery lines primarily along floral themes: Orchid, Magnolia, Calla Lily, Rose and Tulip to name a few. 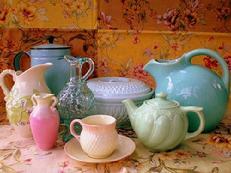 The trendy pastel matte lines of Hull Pottery were in high demand. Hull's product line had expanded to include piggy banks, liquor bottles, and lamps. 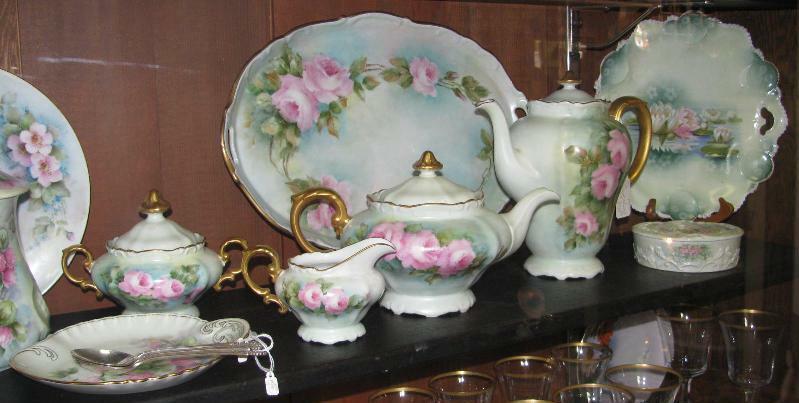 The company's Floristware line was one of Hull Pottery's most successful lines. From the 1940s through the 1960s, a plant or flower bouquet delivered from a florist was often contained in a Hull pot or figural planter. On June 19, 1950, the plant was destroyed in a flood and resulting fire. Primarily because of Hull's excellent reputation with its customers and buyers, the company was able to quickly rebuild and re-opened on January 1, 1952 as "The Hull Pottery Company". J.B. Hull became General Manager. Through the 1950s and 1960s the company continued to expand and diversify its product lines to coincide with the times. New artistic lines such as Ebb Tide, Tropicana, Continental, Parchment and Pine, and Tokay were introduced. In the late 1960s through the mid-1980s, the company changed its production from artistic lines to predominately House 'n' Garden serving ware and Imperial florist ware. J.B. Hull died in 1978. Henry Sulens and, later, Larry Taylor succeed Hull as President of the company. In the mid-1980s the company was plagued with multiple union strikes and foreign competitors. In March, 1986 the company ceased operations and closed the plant. 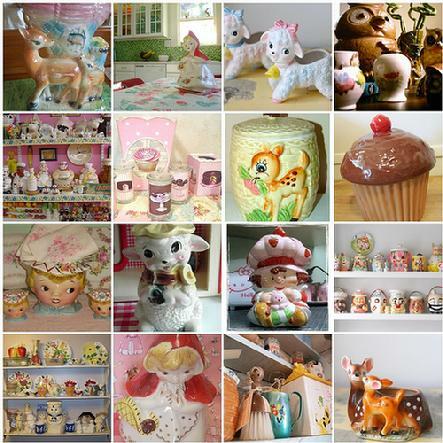 Numerous collectors clubs exist which specialize in collecting Hull Pottery. One such organization, "The Hull Pottery Association" is headquartered in Crooksville, Ohio. This association's goal is to "preserve, educate, and promote Hull Pottery, its collectors, and its heritage." Numerous collectors� books exist as well. Examples of Hull Pottery can be found for sale on numerous web sites. Prices for Hull Pottery pieces of all ages have continued to increase substantially. The supply of pieces in mint condition has fallen while demand from collectors has grown. Addis Emmet Hull, in 1901, founded and managed the Globe Stoneware Company. In 1903, his brother, J.J. Hull helped establish the Acme Pottery Company. Both companies were located in Crooksville, Ohio. A.E. Hull sold his interest in Globe Stoneware in 1904 and began organizing the Hull Pottery also located in Crooksville, Ohio and at one time was one of the largest manufacturers of stoneware specialties. It was formed in 1905 and operated until 1985. In 1907, the Hull Company purchased Acme Pottery. Hull had many collectible lines of pottery, and its production art ware lines and dinnerware lines were some of the most popular. 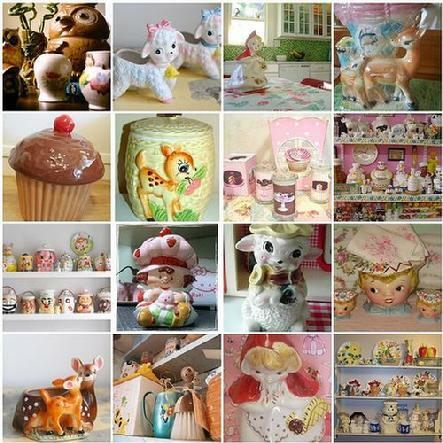 Its cookie jars and pig banks are equally popular and are collected by both Hull Pottery collectors and bank collectors. During the 1920�s Hull had a full line of quality stoneware, semi-porcelain in plain and embossed shapes, decorated with bands and stamps under glaze and over glaze, art pottery both airbrushed and blended glazes. In addition, Hull produced decorated and plain florists� pots and saucers, and garden ware and their lusterware in a rainbow of iridescent colors including orange, shammy, lavender, slate, emerald, light blue, and golden glow. Hull also manufactured toilet and kitchenware, which included saltboxes, jugs, cereal sets, nested bowls, custard cups, and food containers. Hull�s interest had turned toward art pottery in the early 1920�s and began purchasing earthenware china and pottery from Czechoslovakia, England, Germany, Italy and France. The Stock Market Crash of 1929 ended the demand for imports. Addis E. Hull Sr. died in 1930 and was succeed my Addis E. Hull Jr. During the 1930�s Hull began in earnest to produce larger volumes of art pottery and divided their wares in two classifications, Earthenware and Stoneware. In 1937 the Hull Company contracted to produce pottery cosmetic containers for Shulton of New York which included Old Spice shaving mugs, and Old Spice after shave lotion, cologne, and after shave talc bottles. A.E. Hull Jr. resigned in 1937 to accept the management of The Shawnee Pottery Company located in Zanesville, Ohio. Gerald F. Watts succeed Hull Jr. in the management of the Hull firm. From the late 1930�s through the mid-1940, Hull vases in many lines appeared in simplistic style with shapes repeated three to four times in a single pattern with size increasing each time. The early 1940�s foot long decorated piggy banks were introduced. The Red Riding Hood cookie jar was patented June 29, 1943. Design Patent Number 135,889 was issued to Louise E. Bauer of Zanesville, Ohio, assignor to the A.E. Hull Pottery Company, Inc., of Crooksville, Ohio, for �Cookie Jar.� The initial patent expired June 29, 1957. During WWII with growing resentment toward Japan and Germany, America produced items began to exceed those of foreign imports. �Buy American� became the watchword and retail stores began to stock Hull Pottery. Hull�s pastel tinted art wares embossed with realistic floral sprays flooded the market. Hull Pottery shapes included vases, baskets, and ewers, wall pockets and rose bowls. Matte finishes dominated this period of art pottery however the Rosella pattern offered a high gloss coral and ivory finish. Higher costs in producing Rosella gave it a relatively short life. The high gloss was also extremely popular offered in matte shaded pastels and a transparent pink glaze. Hull produced at least three new and different patterns each year. Many designs include Woodland, Parchment and Pine, as well as Floral. Subsequent trials in soft-bodied pastels such as Dawn Rose and Harvest Yellow could not successfully be duplicated. Woodland was produced in high gloss two tones.